Over the past two days 260 educators have been meeting in Auckland at the third National Conference on Pathways and Transitions – Bridging the Divides : Secondary-Tertiary-Employment Transitions for Learner Success. The conference was organised by the Manukau Institute of Technology Centre for Studies in Multiple Pathways in association with Ako Aotearoa, the University of Auckland, the Ministry of Education, Cognition Education and Cyclone Computers. This “family of six” reflects the importance given to the topic and the extent to which it has moved more and more towards centre stage in the awareness of those who care about improving students outcomes. There are two key concepts – the notion of “transitions” and that of “pathways”. We know that the transitions between and within the different parts of the education system are choke points in the journey students face as they pursue an education. The shift from ECE to primary, primary to intermediate and subsequently for all, into secondary, then on into some postsecondary education which finally move into employment is a reflection of a system that is built for the adults that survived rather than the learner/student. Dr Joel Vargas from the Jobs for the Future Foundation in Boston U.S. showed that the loss of students at transition points was an issue that went well beyond our shores. We know that we “lose” over 4,000 students between primary and secondary, that 20% of students drop out, that half of those starting a postsecondary qualification do not complete. Much of this waste of talent and potential is the result of the issues surrounding transitions. And there is that transition form the stages of education into employment. Associate Professor Leesa Wheelahan (University of Melbourne) reminded the conference of the weak link between education and employment, a point reinforced by business leaders who addressed the conference. Transitions need to have “pathways” if they are to lead to the levels of seamlessness that will address the issues of the dysfunctional transitions which might more correctly be thought of as fractures. Pathways are seamless, start somewhere and arrive somewhere else. In themselves they are an organising principle that calls for connection and quirks each of those who work on each side of the crevasse to work together. It is interesting that some of the systems we admire have solved this issue through looking to sector reform to shape a system based around the needs of young people rather than around the sensitivities of adults. 260 educators working to address these issues simply have to make a difference. There is developing a community of practice that is seeking to construct new pathways and transitions with a more seamless approach to create increased likelihood of more positive educational outcomes for more students. This was a clear message of the Minister of Education Hon Hekia Parata who in addressing the conference emphasised the Better Public Service goals as clear markers for outcomes which the system must work towards. This will require us to work differently but this will not always require us to embrace startling and new or radical ideas. As has been a theme of recent EDTalkNZ pieces, some of the ideas have moved across the education stage before. 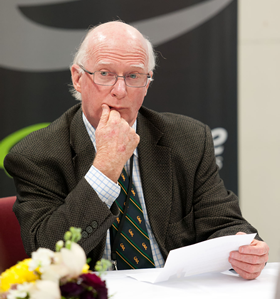 The notion of a “jagged edge”, even “seamlessness” and the reforms of Post Compulsory Education and Training in the 1980s had canvased many of the changes now being seriously considered – a point made elegantly by Professor Gary Hawke who led the reforms back then. Professor Hawke made an interesting point in his reminder that we need to focus on post compulsory rather than postsecondary. So it was an exciting gathering where ideas surfaced and were considered, where for two days there was a coming together of people working towards shared goals. The things that divide us in education were parked at the door and students were considered. Many were impressed by the eloquence and directed energy of the students, especially one who had gone through the MIT Tertiary High School. He had made the transition from risk to reward, from being given no hope in school to seeing a pathway that would take him into a job he loves and which opens up a big wide world. It is early days but directions are emerging that hold the promise of an education system that will deliver pathways to students that see them college (postsecondary) ready and career ready. If we can achieve this we will perhaps avoid the demographic time bomb that ticks away and was so clearly described by Sir Mark Solomon. It could be that in time is not on our side in these issues. 2013, the Year of the Snake and a whole lot more besides. No doubt some of the old issues from 2012 will continue to percolate if not go on the boil. Novopay now has a new Minister looking after it. It was a good move to remove the distraction that this has been from the very critical issues of schooling that we face. Not that the teacher pay issues are not critical but it is essentially a technical issue. There are a couple of questions that I have wondered about in all this business. Why has the School Trustees Association been so silent and at a distance from all the troubles? After all they are the employers of the teachers and the employment issues created by the whole affair is between teachers and support personnel and their respective boards. The other question that has yet to be answered is about the quality of data input. There is an old I.T. term, GIGO, that has been the source of many a solution. It stands for Garbage In Garbage Out – in other words, a problem can exist through errors in input. That so many teachers and others are being paid correctly suggests that this is not the source for many but the nature of the gross mis-payments which has seen some teachers paid grotesquely huge amounts might arise through misplacement of decimal points or reversal of variables or something along those lines. The State sector has a history of failed I.T. projects and one hopes that this is not another one. The other 2013 issue will inevitably be the Partnership School Kura Houora development. First the Education and Science Select Committee hearings and then the selection of sponsors and then… Meanwhile across the Tasman it all happens almost under the radar. Queensland today launches 26 Independent Public Schools which are to be given greater freedoms in funding and its use and in the appointment of staff. Mind you, they already have the fire and the floods, if plague and famine appear we will know that they have offended the gods! In New Zealand we have to be content with the offence to the idea taken by the teacher organisations. I was amused at the image of the teacher (male) sitting with his feet up on the teacher’s desk which appeared in one of the anti-charter school advertisements. I was amused because a couple of years ago, a campaign in favour of charter schools and academies in the United States denigrated the public schools with the image of, you’ve guessed it, a teacher with his feet up on the teacher’s desk. An ordinary idea can only be beaten by a good idea and that can only be beaten by a better idea – so where are the ideas that will see clear and more equitable education outcomes from our education system? We know that the experience of charter schools in other countries has seen excellent ones, mediocre ones and downright poor ones. Interestingly the proportions of these categories is about the same as the proportion of excellent public schools, mediocre public schools and poor public schools. We have about 2,800 schools in New Zealand, establishing three partnership schools will hardly be a silver bullet nor will it bring the house down. But why would we not believe that we can have three excellent ones? Finally I note that Teach First NZ, the pressure cooker programme which sees an intensive pre-service teacher education programme precede teaching in the schools with on-going instruction and support, has placed its first crop of recent graduates into schools. It was interesting that one of our university Education Faculties led the charge with this. A similar idea proposed thirty years ago to meet the needs of multicultural schools, a new phenomenon then and largely a mystery to teacher educators, was rejected by all concerned at that time. But good ideas have a habit of resurfacing. I have had the pleasure of working with several schools in those get-back-to-work PD days that herald the imminent arrival of the challenges. I am continually buoyed by the quality and enthusiasm of these groups. A good way to start the year would be to commit to the goal of high esteem for teachers, schools and education, less of the negativity from the leadership, less of the polemic, lower fear of ideas, brutal honesty about outcomes, a drive back towards simplicity of purpose and fun. That would be both a good start and Finnish. Talk-ED: That was the year that was… what? Another academic year, another school year, another calendar year draws to a close. Down south we are blessed by the double impact of alignment between the academic year and the calendar year. The pressures and heightened activities of both conspire to produce a feeling that it is all a bit too hectic and we resolve that next year we will manage all this differently. But we never do. It is the conventional response to be tired at this time of the year. Everyone is “looking forward to a break” and holiday plans are chatted about with enthusiasm even those that entail staying at home and rejoicing in a city emptied of the crowds who have now gone elsewhere to be crowds. This year has, in New Zealand anyway, been a rather irritable one for education. The school system was stirred by a number of issues that arose just as last year’s issue – the introduction of national standards into primary schools – was settling. It had been a long battle between schools who felt that the standards (NZ’s answer to NAPLAN) were damaging and constricting, unnecessary and misleading. On the other hand the Government felt that they gave valuable information to parents and caregivers that was necessary and informative in a manner that should not impact negatively on the school. It was a long discussion but schools by and large grumpily got on with the job. Then along came the issue of student / teacher ratios – the formula used to calculate the number of teachers in a school. This turned overnight into an autumnal storm of impressive proportions. There were winners and losers in this – the senior secondary school being the winners – but this was quickly lost in the discussion, especially when it was realised that an allowance that delivered a considerable number of teachers to intermediate schools had also gone. The Government blew the whistle and called the whole thing off. Claims of victory and defeat masked the fact that once again current practice had prevailed and things would carry on the same. But not for long. The Minister of Education announced the establishment of a Minister’s Cross Sector Forum for Improving Achievement – a gathering of about 20 people who reflected the whole system, its component parts, its sectors, its major community groups and so on. The discussion had gone indoors rather than being played out in the media. Here was an opportunity for vigorous discussion across the system to address the issues of why so many young people were failing and why so many were disengaging when so many were succeeding and doing well in our bipolar education system. In middle earth can the conundrum of western education systems be unscrambled? Watch this space. At last early childhood, primary, secondary and tertiary educators were starting to address some of the key topics. The urgency of this was increased by the commitment of the Government to a set of Better Public Service Targets which included three overtly aimed at education: access to quality early childhood education, the levels of graduation from high school and the numbers obtaining a post secondary qualification at about a diploma level. These are each a serious challenge to the education system and it is clear that there is work to do. So it wasn’t helpful that when a new teacher payroll system was introduced it contained quite a few blips. This is a huge payroll with over 90,000 being paid each fortnight. So inevitably there would be slips and errors. This was neither desirable nor a surprise. What did surprise was the feeding frenzy from the media about the whole business. Teachers in New Zealand are not employed by the Ministry of Education but by their local school Board of Trustees. The employer / employee relationship is between the individual and his or her Board. But you could get no sense of that as the Ministry of Education in its role as salary servicing agent was the target for the raised voices. Years ago I recall a similar situation and then the school Board as employer simply paid the teacher who had missed out by cheque and sorted it out. But the opportunity for yet another public stoush was not to be lost. And that was a distraction somewhat for at the same time things were happening at the post-secondary level. The Tertiary Education Commission had decided that in the next round of funding, increased proportions of the lower level entry programmes in tertiary institutions were to be withdrawn and reallocated to the private sector and to the Wananga. The consequences of this are profound not only for the impact on institutions losing significant amounts of funding, but also for the impact on the nature of those entry areas in tertiary institutions. The polytechnics in New Zealand have the role of being the open access institutions that can take those who wish to work towards a serious qualification from wherever they are to that goal. The Community Colleges, TAFE institutions and further education provision, all play a similar role in other countries. This provision of a seamless progression through those early years and into “real qualifications’ is central to lifting achievement. But this could not attract the attention of the mainstream media. That was partly because they were still thumping the drum on the restructuring of schooling in post-quake Christchurch. It is clear that the kinds of changes – mergers, clusters, reshaped institutions – are the sorts of changes that will have to become more common throughout New Zealand as the system repositions itself for the changing demographics. Christchurch is an early starter in this because of the damage brought about by two major earthquakes. The thousand of after-shocks have left people feeling that they need respite from all this. It’s bad enough driving to work on a wet morning on a wet Monday on a wet motorway without having to flick on the radio and listen to an educational leader complaining about how wrong it is of Ministry of Education CEO, Lesley Longstone, to draw attention to the fact that the New Zealand education system has flaws which challenge its claim to be a world class system. In the Foreword to the MOE Annual Report, Lesley Longstone paints a picture that is thoughtful and based on analysis of the facts. Unpalatable that might be to some, but until the problem is articulated the solution is unlikely to follow. The willingness of the MOE CEO to put it clearly is to be applauded. Essentially, her argument is this. New Zealand achieves high results with a significant proportion of its student population and these students are predominantly Pakeha and Asian. In this respect the system is world class. This generalisation masks the fact that there are in our system Pakeha and Asian students who are not getting good results. That’s how generalisations work. Now the other generalisation is that with Maori and Pasifika students, our system is not getting good outcomes and in this respect our education system is not world class. It is clear in the Foreword that her time in the New Zealand system has led her to believe that the issues that this raises are of such a proportion that we can simply lay no claim to being a world class system overall. I have pointed out that our system is bipolar for a long time and was once rapped across the knuckles for doing so. But the facts have been there for a long time and PISA among other surveys continues on further analysis to show just that. Educational outcomes for Maori and Pasifika students (groups that are rapidly increasing proportionately in our school system) are clearly and dramatically behind those for Pakeha (a diminishing group) and Asian (a growing group). The fellow complaining about Longstone’s analysis of course adopted the Finnish Default argument saying that a recent visitor from Finland had noted a number of features in our system that he was impressed with and wanted to consider their place in the Finnish way of working. This is absolutely how it should be. But one, two or even a dozen swallows do not a summer make. I have studied the Finnish system closely and it is unlike ours in a large number of very fundamental ways. We could do well to take note. Finland has the smallest gap between schools of any system – perhaps it is us that should be asking them how to it is so. None of the other higher ranking systems other than the Anglophone ones have the rather negative outcomes listed above. A world class education system delivers sound educational outcomes for all its citizens. Intellectual honesty and a willingness to face the reality of the situation is the only sane way in which we might get improvement in our education. To continue to do the same thing and expect different results is simply a clinical diagnosis of madness.